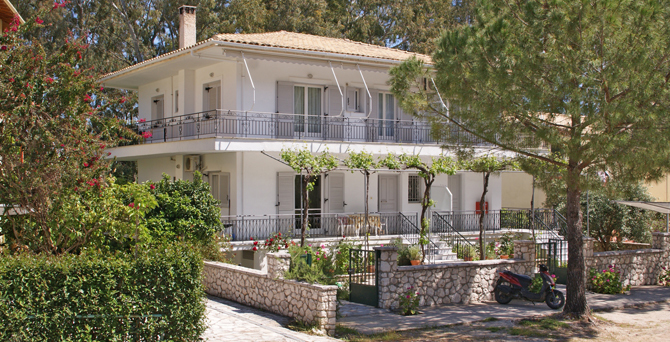 The residence located at the beginning of the village Nikiana on the east coast of the island, at a distance of 7km from the town of Lefkada and 8 km from Nydri. Consisted with studios that can accommodate from 2 to 4 persons and apartments for up to 6 persons. Kasandris Apartments is surrounded by eucalyptus trees and several other native trees.The distance from Episkopos beach is just 80 meters away where you can enjoy your daily swimming, while at a very σηορτ distance (250m.) you can find the beach “Limni” that is rich in sand inside and out of the waters, this beach is ideal for families with young children because its waters are shallow. All studios and apartments come with space for meal preparation with electric hobs, fridge and all necessary utensils for cooking. All rooms have air conditioning, and spacious exterior areas (balconies). Moreover, for our customers there is available wireless Internet as well as private car parking.